How long does it take to buy a loaf of bread? A pair of shoes? A car?These are trick questions. Imagine a hundred potential customers in the same store, each holding a stopwatch. Some of their stopwatches are ticking very fast (grabbing a bottle of wine before a party), some glacially slow (agonizing over the perfect bottle for a first date). Some, in fact, aren’t ticking at all.For today’s savvy marketers understanding how much time and energy consumers are willing to spend shopping for their product or service is the single most important (yet overlooked) factor in maximizing sales. 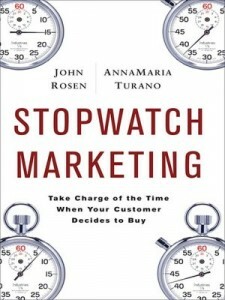 After years of advising clients who sell everything from all-natural fruit juice to health insurance, John Rosen and AnnaMaria Turano have learned that capturing a consumer’s attention at precisely the right time and holding it through the purchase decision requires a strategy that they call Stopwatch Marketing. It is the method of adjusting your marketing strategies to match the shopping styles of your customers. Goodyear turned Assurance with TripleTred tires into a billion-dollar success story built on a shopping cycle that takes less than an hour. Roto-Rooter became the only legitimate brand in its category by controlling the typical Yellow Pages users’ 50-second search pattern. Whole Foods reinvented the supermarket shopping experience to slow down their customers’ clocks. Microsoft exploits shoppers’ reluctance to spend time researching alternatives to their Office software. Lexus begins targeting customers up to a year before they set foot inside a dealer showroom. In a world where consumers are assaulted with thousands of different marketing messages every day, the biggest challenge is to align the content and timing of your messages to the amount of time buyers have for hearing them. Stopwatch Marketing shows how to do just that and increase your bottom line as a result. 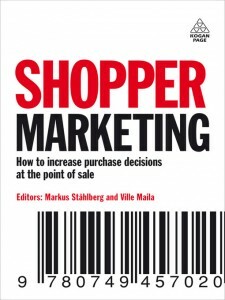 Shopper Marketing is a collection of articles written by 34 individuals contributors from around the world, edited by Markus Stahlberg & Ville Maila. Shopper Marketing explores the subject of focused marketing initiatives aimed at browsers and shoppers who are in – store and can be influenced in their final buying decisions. Written by more than 34 experts from around the globe, Shopper Marketing shows the most effective ways of converting shoppers into buyers at the point of purchase. Providing practical advice about shopper needs and trends, retail environments, shopper marketing strategies and campaigns, retailing relationships, effective packaging and much more, this accessible title- now with a new foreword by Philip Kotler – is a must- have for all marketing, sales and retail practitioners, as well as students of sales and marketing.